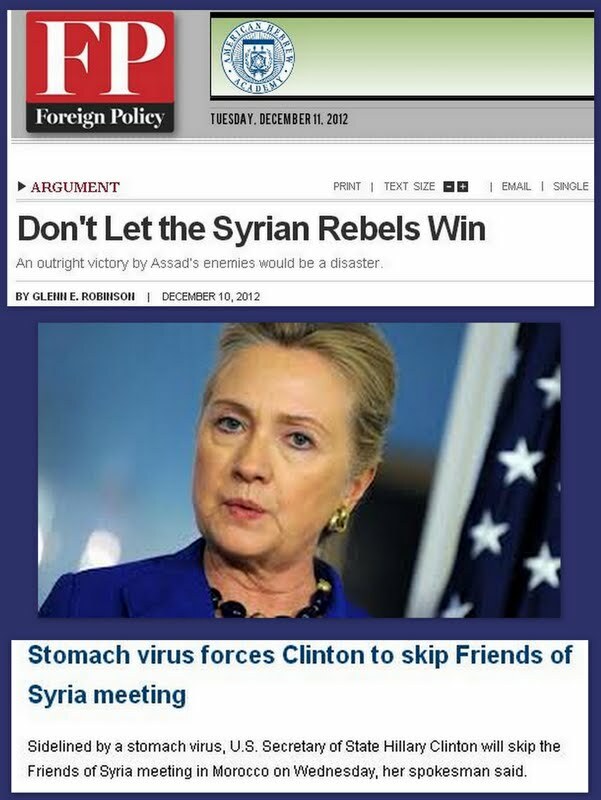 A stomach virus is forcing U.S. Secretary of State Hillary Clinton to cancel her trip to the “Friends of Syria” meeting in Morocco that will focus on ratcheting up support for the Syrian opposition. Clinton was to announce that step in Marrakech on Wednesday. Deputy Secretary of State William Burns will take her place, but sober thinking makes me wonder if he will still make the declaration or circumvent it. Since the proof of the pudding is in the eating, tomorrow’s denouement will show whether Clinton’s illness is physical or diplomatic. While Clinton’s trip to Morocco was still on, Ms Nuland gave a muddled answer, saying: “Well, you know that we have, as the Secretary said, been looking at ways that we can deepen and broaden our support. We will be in Marrakesh on Wednesday – the Secretary will be – for the Friends of the Syrian People. I think we want to talk there about more support that we can give them along the lines of what she foreshadowed last week, but I don’t want to get ahead of announcements that we might make. Other than Nuland’s nuanced answer and Clinton’s no-show in Marrakesh, there is a third downer for the Syrian opposition. It’s a think piece titled “Don’t Let the Syrian Rebels Win” appearing in the new edition of the authoritative U.S. bimonthly newsmagazine Foreign Policy. Egypt’s brilliant columnist and talk show host Imad Adeeb, writing today for the Saudi newspaper of record Asharq Alawsat, says he met yesterday in Cairo with Rob Malley, a former Special Assistant to President Bill Clinton who is currently Program Director for Middle East and North Africa at the International Crisis Group in Washington, D.C.